It may have been Friday the 13th, but Old Crow Medicine Show fans no doubt felt lucky to be present at what was a sensational show of high powered acoustic music played with enormous energy and flamboyance. 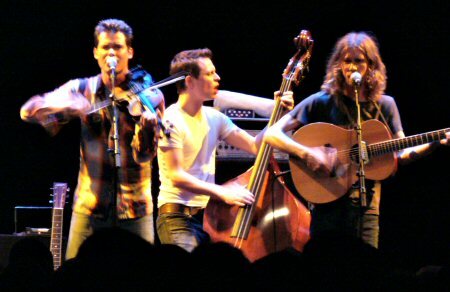 Old Crow Medicine Show is a five piece band comprising Kevin Hayes (Guitjo and Vocals), Ketch Secor (Fiddle, Harmonica, Banjo and Vocals), Morgan Jahnig (Upright Bass), Willie Watson (Guitar, Banjo and Vocals) and Gill Landry (Slide Guitar, Banjo and Vocals). They hail from Nashville and have been garnering a wide following through constant touring. This was their first tour of Australia and they are certain to have won new fans with what was certainly a fantastically good live performance that rocked the Forum to its core. 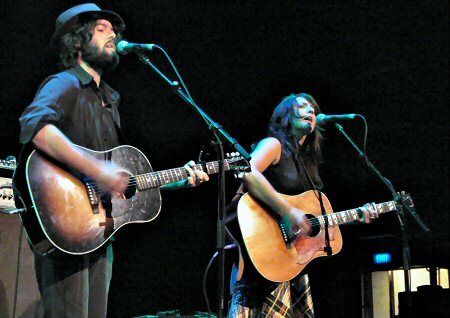 Before the feature event the audience was treated to two diverse support acts, the talented duo Jordie Lane & Tracy McNeil (Fireside Bellows) performed a mellow set showcasing songs from their highly regarded No Time To Die CD. They were followed by Tim Rogers and band who upped the tempo, performing a set of rather good rock music. I was pleasantly surprised by Tim Rogers' performance, having previously seen him as support for Gillian Welch and instantly forming a bad impression. OCMS took the stage at about 9.00pm and performed two sets in all, with a generous encore of three or four songs, dubbed the third set by main spokesman Ketch Secor. My attempt at noting the set list was not successful as my notes were illegible, but during the three hour show, highlights included Down Home Girl, Tennessee Pusher, Minglewood Blues, and Methamphetamine. They also performed a bluegrassy version of the Bob Dylan song Lay Lady Lay and finished the main show with the rousing Union Maid. A great many of the songs were taken from their last two albums Big Iron World and Tennessee Pusher. During one song, the floor crowd spontaneously waved their boots in the air. The significance of this totally escapes me. As a band OCMS are fascinating to watch - very lively and flamboyant. Willie Watson, one of the principal vocalists, roved all over the stage engaging with his band mates and the action was interspersed with the occasional clustering of instruments, bluegrass fashion, around a single mike. Various members of the group regularly swapped instruments - banjo for guitar, guitar for fiddle, all played in a masterly fashion. Ketch Secor provided most of the stage patter, expressing great enthusiasm for the Victorian countryside and Melbourne city. He has a distinctive voice, but it blends well in harmony with Willie Watson and Kevin Hayes who also over the course of the evening, led the singing. OCMS have taken old time Americana and folk music in an exhilarating new direction, bluegrass and country music played with a rock attitude. For sure the Forum crowd got their money's worth and there is every indication that an evening with the Old Crow Medicine Show will be repeated in a not too distant future.